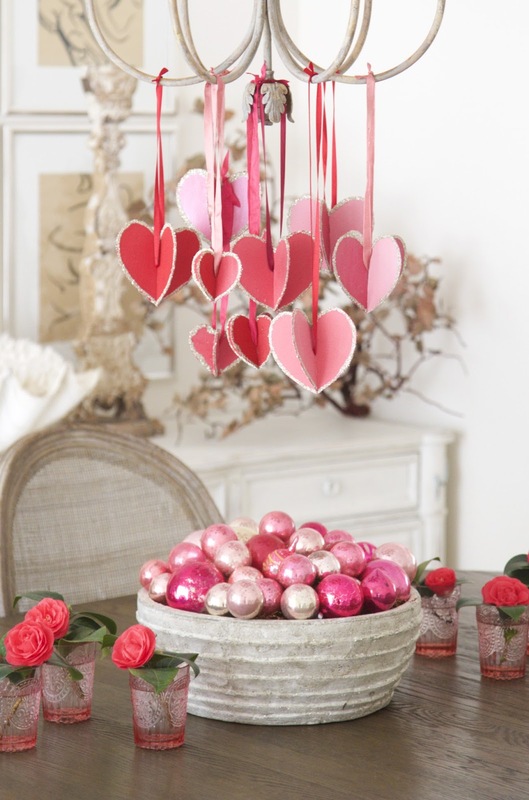 To sweeten our home for Valentine's Day this year, I made 3-D paper hearts that float over my Valentine Vessel in the dining room. Bring whimsy to your own Valentine celebration using my easy DIY: Hearts and Crafts directions! I grew up making these hanging hearts, though they are a bit more sophisticated and elegant than before :). My favorite hearts are the ones that are made of different hues, like the red and light pink one above. Glass-glitter lines their edges. 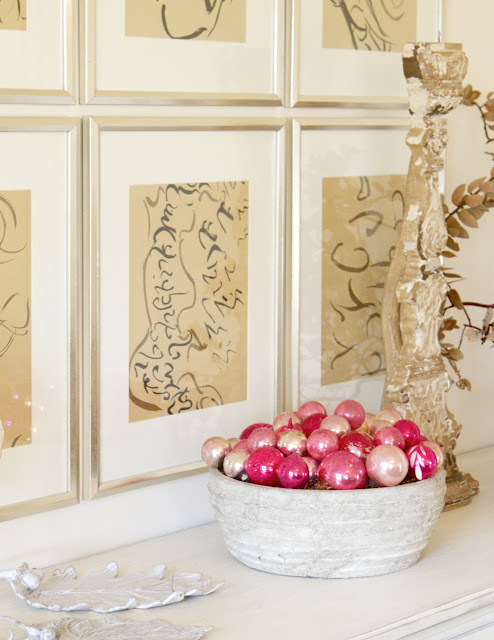 In an attempt to mimic the colors in the pink antique ornaments, I mixed acrylic paint in red and light pink to create different shades. 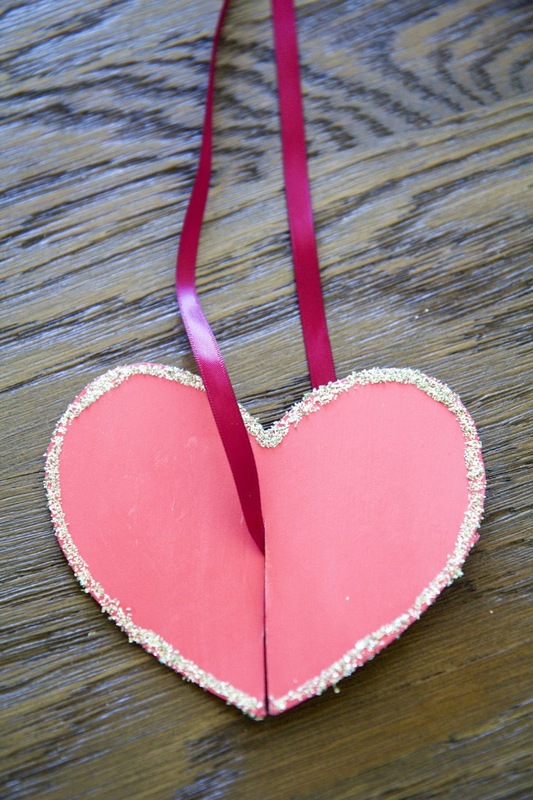 Silk ribbon in an array of colors (red, mauve, magenta, crimson) add extra interest. 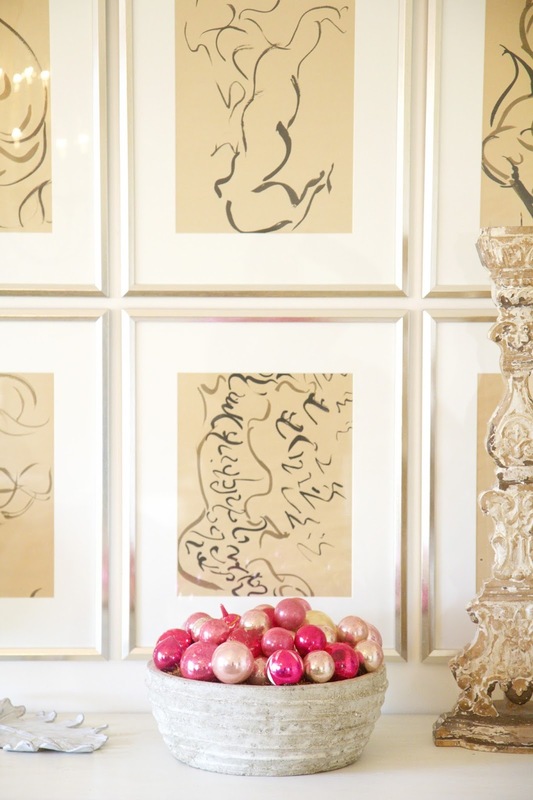 Flanking the dining table centerpiece, pink goblets stand in as small vases. They hold red hot camellias that, (in a Valentine miracle that only Cupid could have designed), always bloom in my garden this time of year. 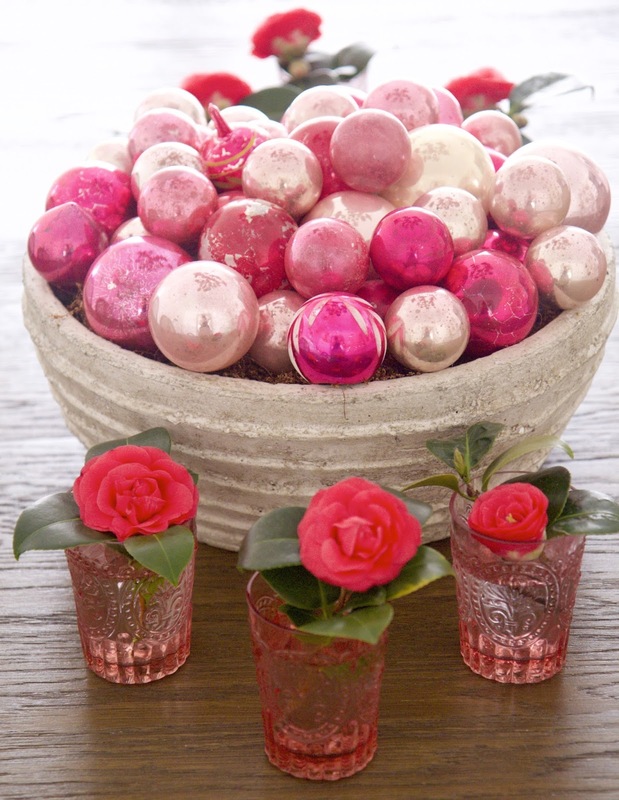 At nighttime, the addition of candles will make this Valentine centerpiece perfectly romantic. 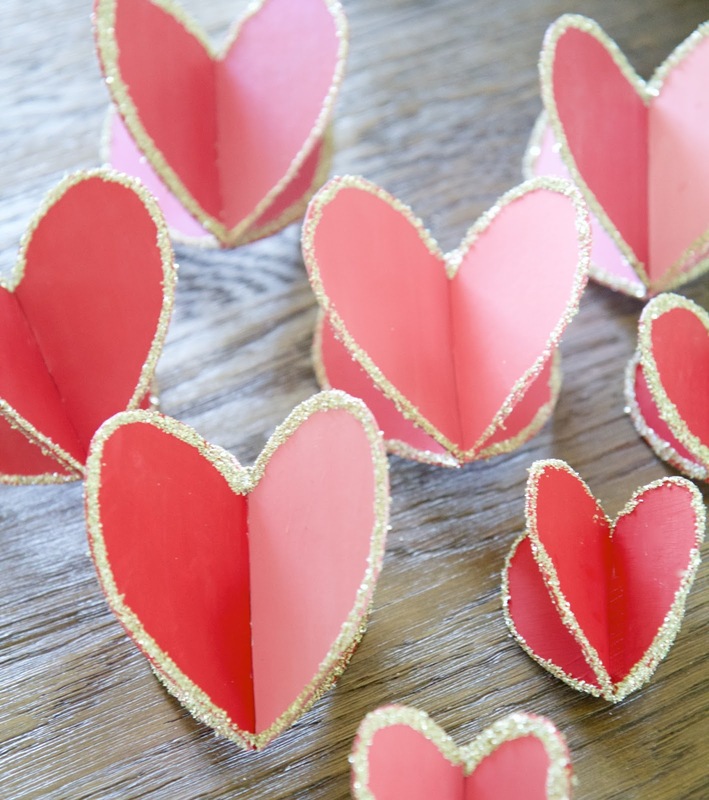 Make your own DIY: Hearts and Crafts and surprise your Valentine (or yourself) this year! 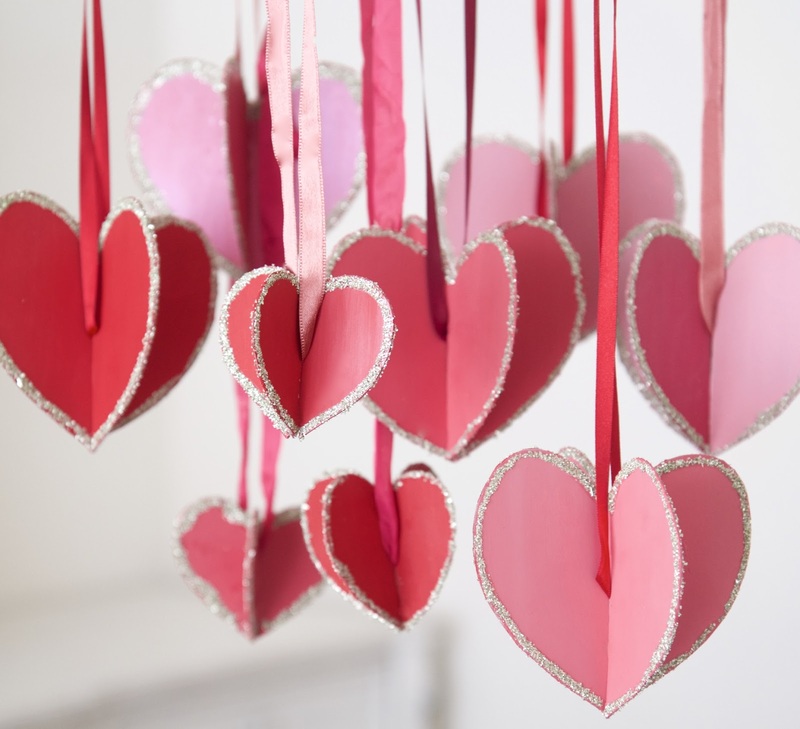 Thank you for visiting Nora's Nest, and have a Happy Valentine's Day! If you enjoyed my Hearts and Crafts for Valentine's Day post, below are the DIY directions on how to make your own hanging hearts! 1) Cut out a heart template. 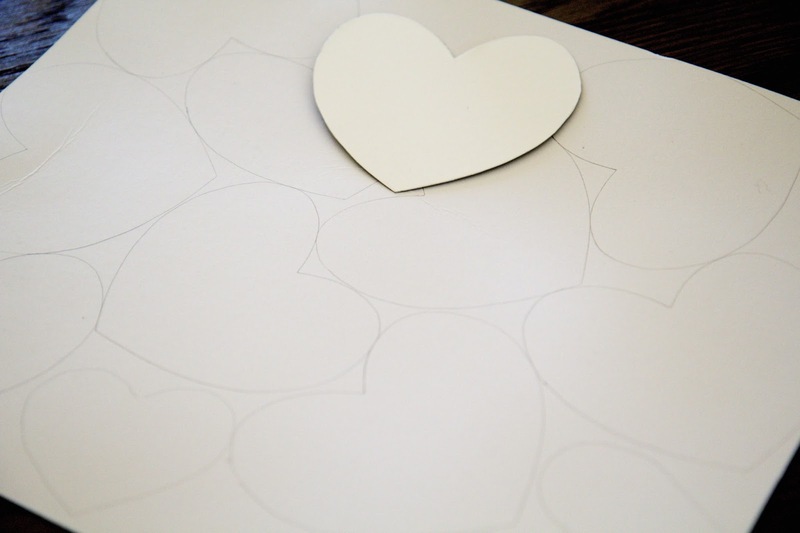 2) Trace the template onto the cardboard paper as many times as possible. 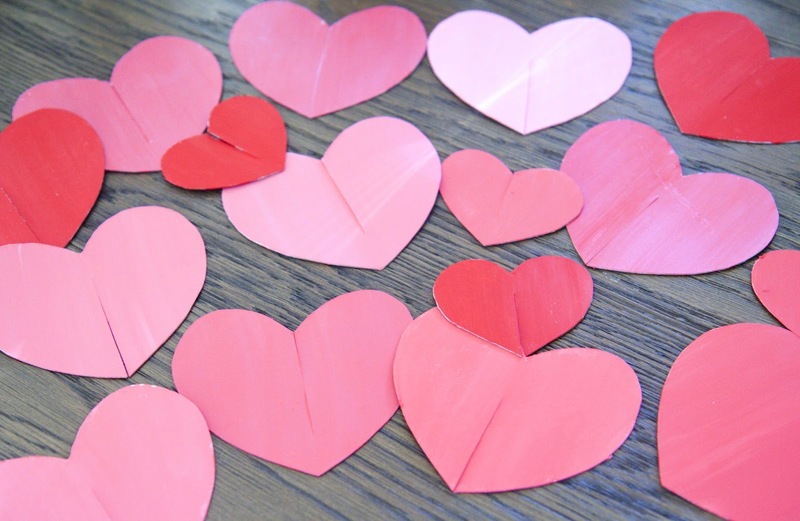 Create an even number of hearts as two cutout hearts will create one 3-D heart. 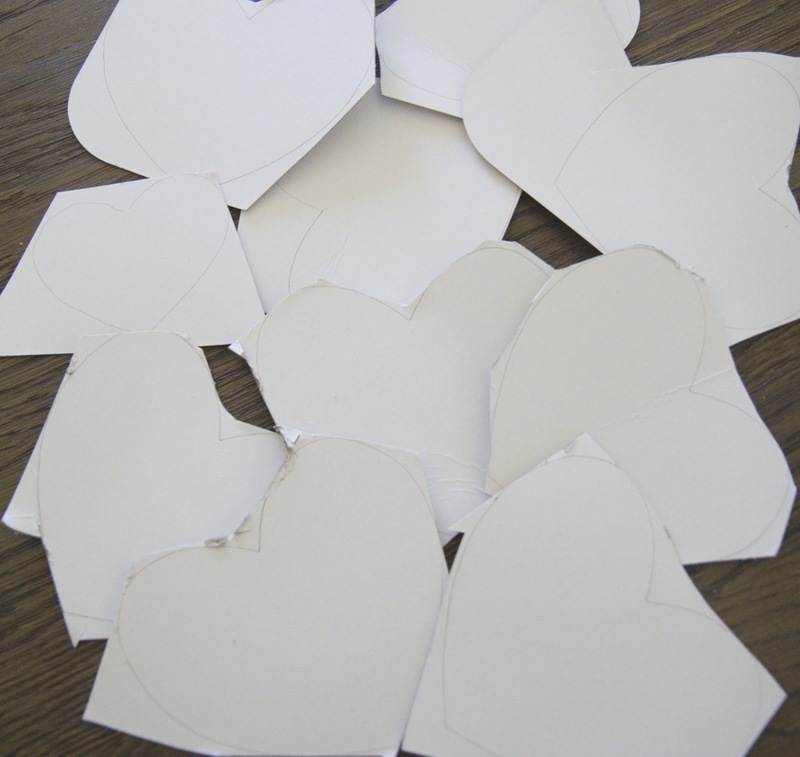 3) Cut a rough cut around each of the hearts first. 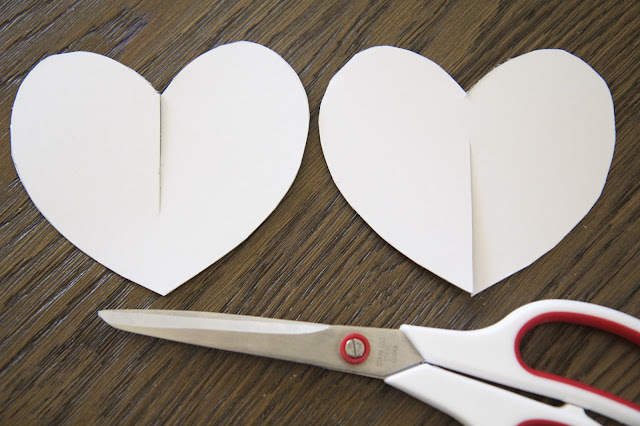 This will make it easier to cut the hearts with more precision later. 4) Finish cutting out the hearts. 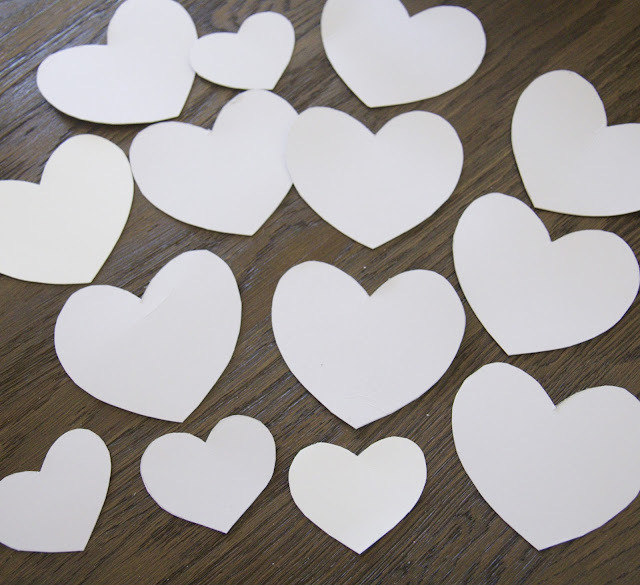 I cut out two different sizes of hearts for more variety. 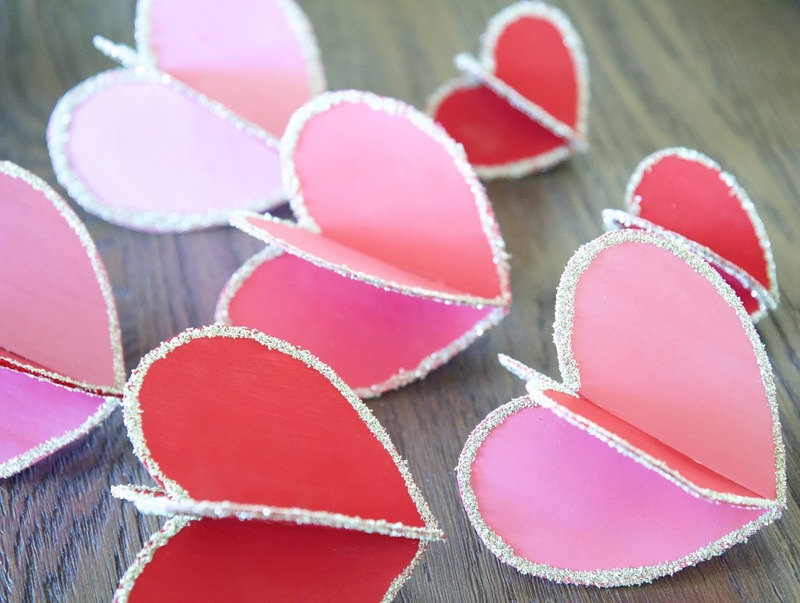 5) For every pair of hearts: Cut a slit from the top center on one. Cut a slit from the bottom center on the other. The slits should slightly pass the middle of the heart. 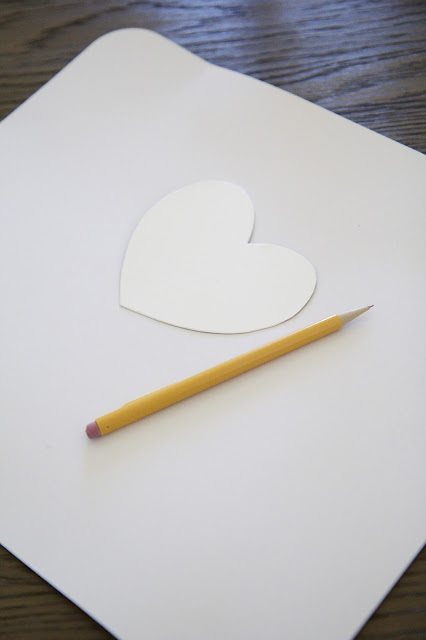 6) Gather your hearts and get ready to paint them! 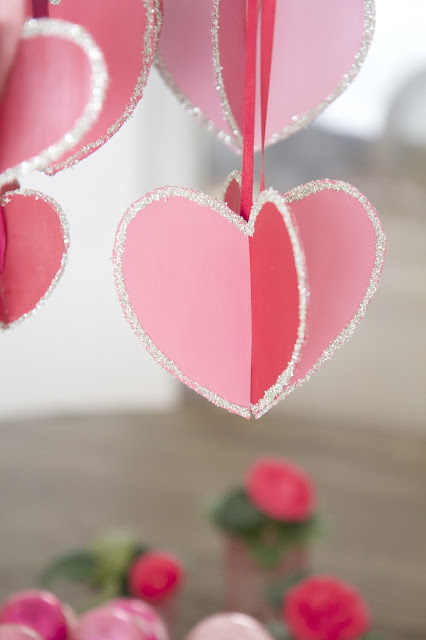 7) Using acrylic paint and a brush, paint whatever color you desire on both sides of the heart. I mixed red and pink paint to create a variety of different colors. Allow to dry, about five minutes. 8) Next, line the edges of each side of the heart with craft glue. Take your finger to smooth out the glue and create a clean line. 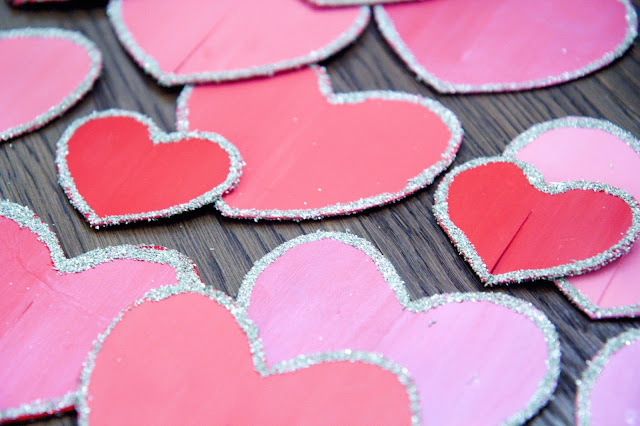 9) Pour coarse glitter over the glue and repeat on the opposite side of the heart. Allow the glitter to dry very thoroughly, a few hours. 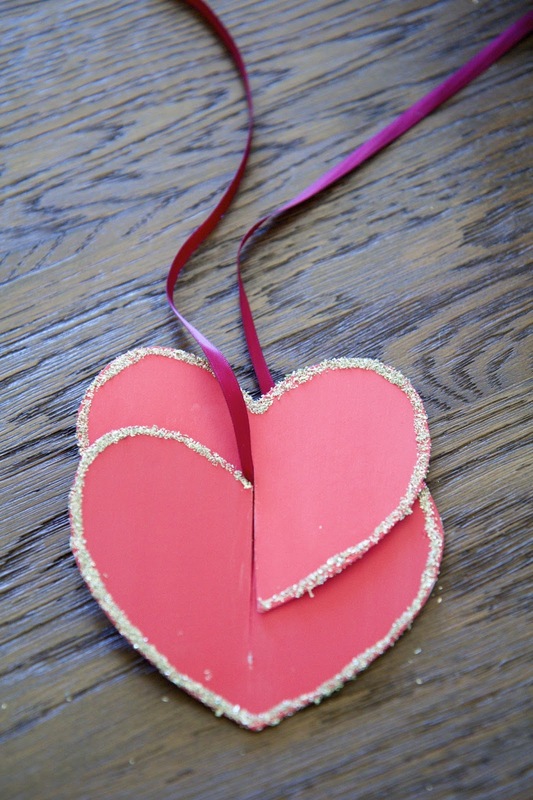 10) Taking a heart with a bottom slit, thread the ribbon through until it reaches the top of the slit. 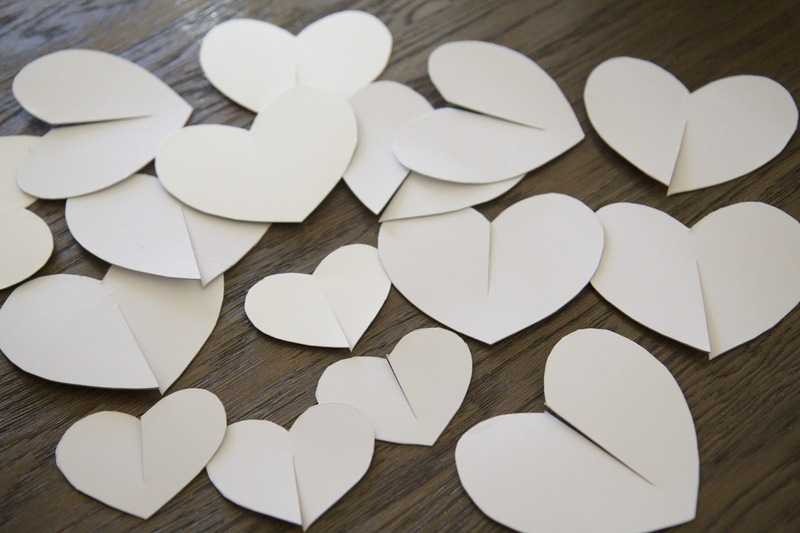 11) Taking a heart with a top slit, slide the two hearts together. 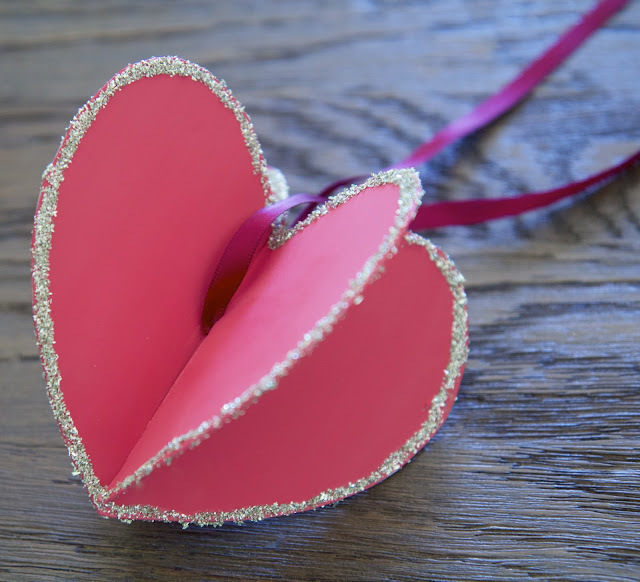 The 3-D heart is complete. 12) Tie a knot at the top of the ribbon, and voila, it is ready to hang! 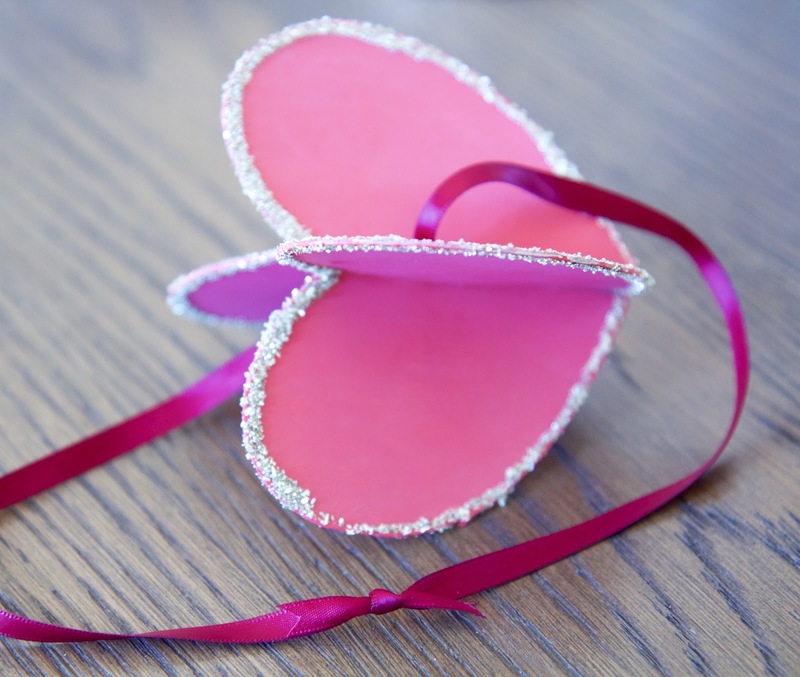 Here's what the finished hearts look like without ribbons. 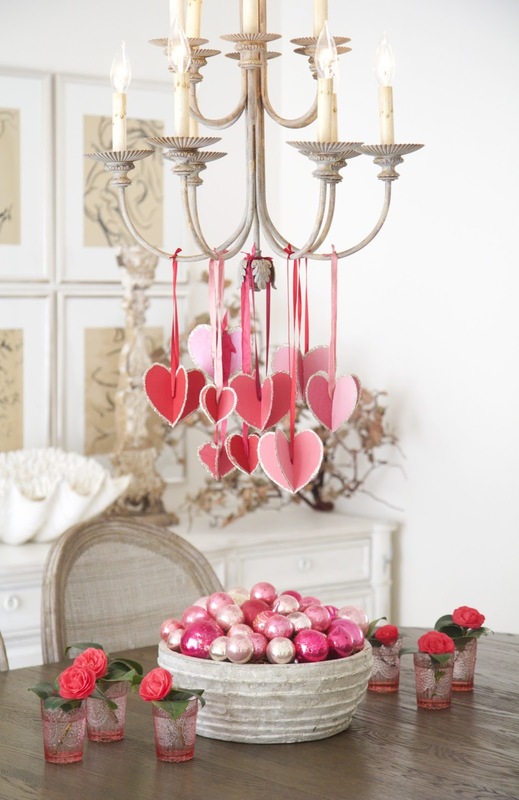 Darling to have just sitting around a Valentine table! 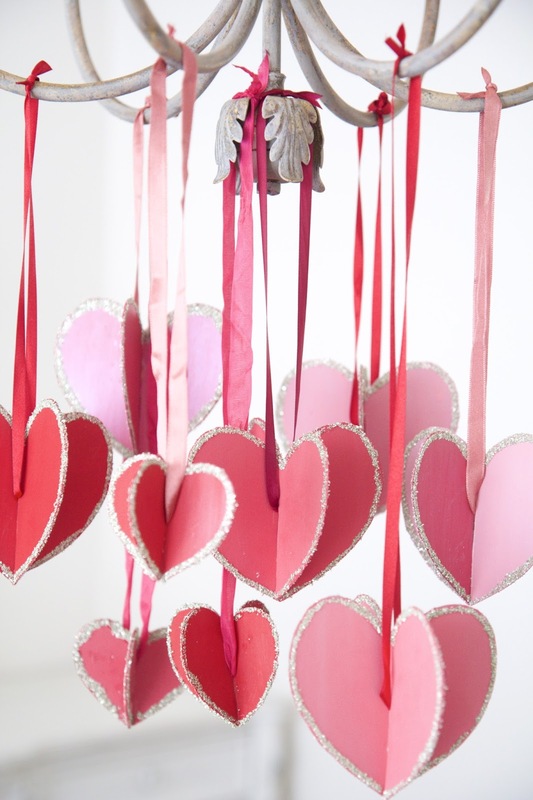 To see the hearts hanging in my home, check out the finished Hearts and Crafts for Valentine's Day project! 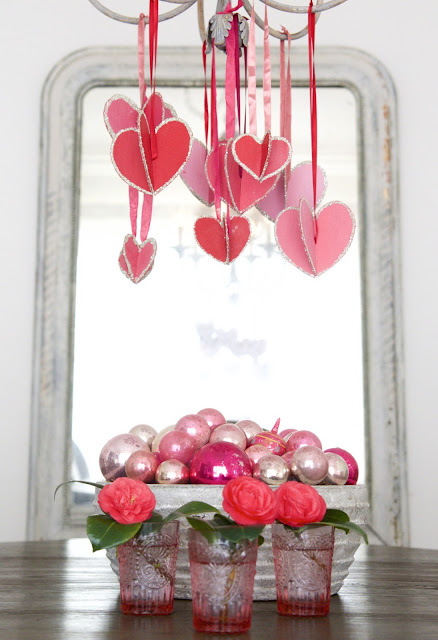 Thank you for visiting Nora's Nest, and Happy Valentine's Day decorating!! After six years of marriage and a little one in tow, I think my husband may have figured me out a little bit ;). While wandering around an antique shop this past weekend, my husband called out to me (without showing me his secret find), "Hey sweetie? I'm just going to go ahead and put this at the register. I know you're going to want this thing." 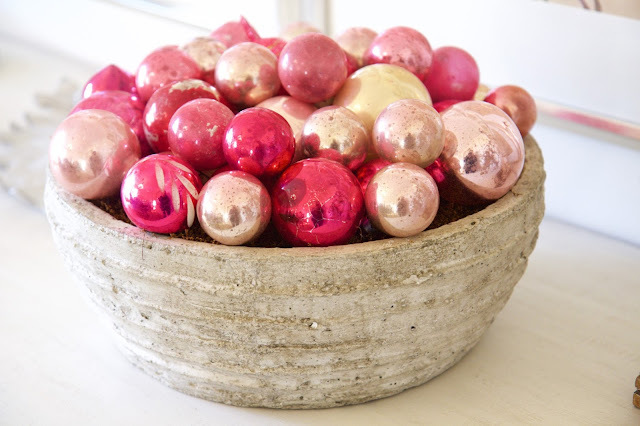 "This thing" was just about the most fabulous concrete bowl I have ever seen, and when we brought it home, I knew it had to hold my collection of pink antique ornaments from years past. Voila, a sophisticated Valentine Vessel was born. Thanks to my Valentine! 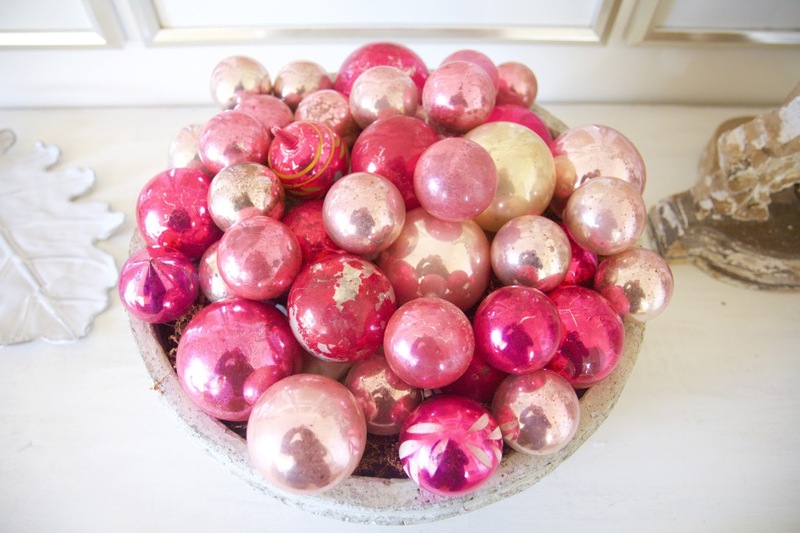 From the softest hue to the hottest fuchsia, this bowl runneth over with pink ornaments. 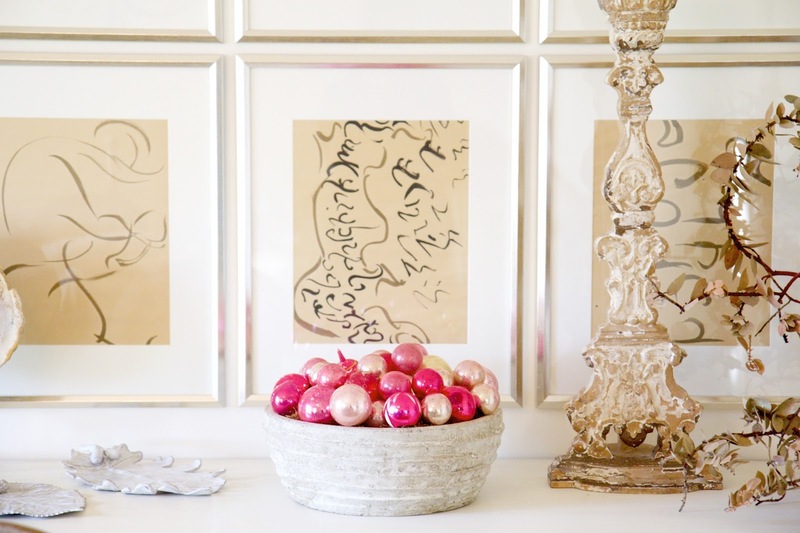 The pop of color is a perfect juxtaposition to the rough cement bowl and neutral backdrop. 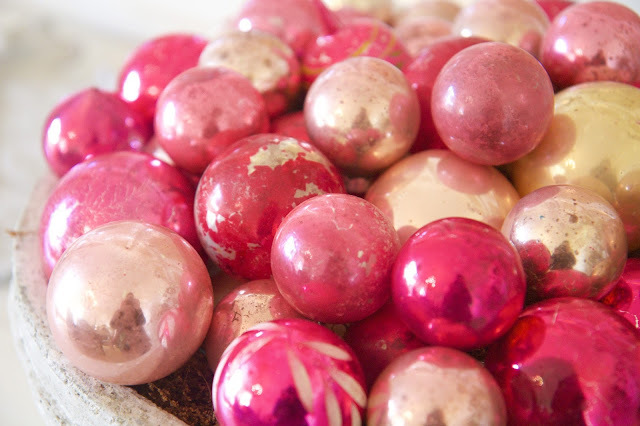 The ornaments are crackled, distressed, and paint-chipped. 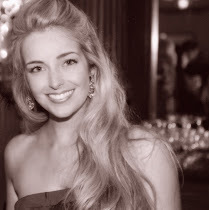 Each is unique and lovely. Along with this fabulous bowl, I've been redoing our dining room and can't wait to show you the results soon. Stay tuned! 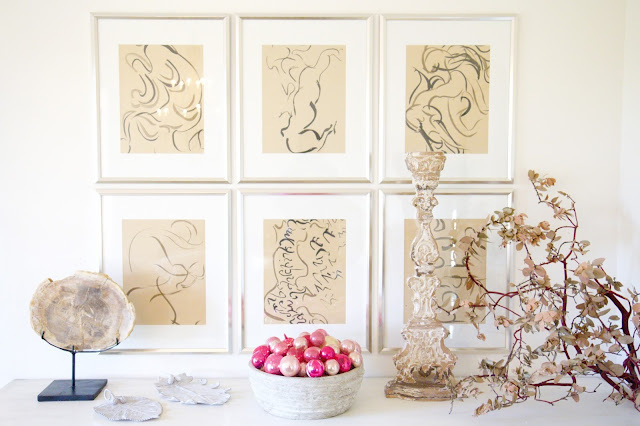 Want more Valentine decor ideas? 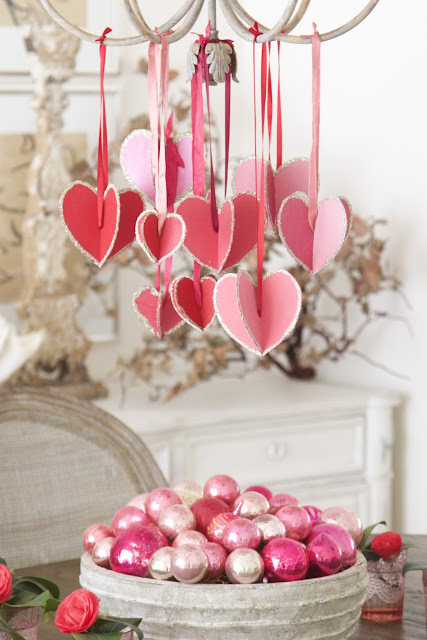 Thank you for visiting Nora's Nest, and Happy Valentine's Day Decorating!